EU set to resume ties with Cuba. The European Union is preparing to resume ties with Cuba following a decade-long dispute over human rights, EU diplomats said Thursday. Experts from the EU’s 28 member states this week “agreed on the principle of reviewing relations with Cuba,” an EU diplomat told AFP on condition of anonymity. an agreement to engage in political consultations. Poland and the Czech Republic, former Communist states that long opposed launching ties with Cuba due to its “human rights record”, had lifted their objections, the source said. Another EU source said experts were working on documents needed to begin formal negotiations on a “Political Dialogue and Cooperation Agreement”. Earlier this month, Netherlands Foreign Minister Frans Timmermans called for an EU rethink on Cuba. “I think it’s time for Europe to revise its position on Cuba and negotiate a new position,” he said. The EU suspended links with Cuba in 2003 after a crackdown which saw 75 dissidents thrown into jail. All of those imprisoned have since been released. Since dialogue between the EU and Cuba resumed in 2008, several bilateral agreements have been reached between Havana and around 15 members of the EU, which maintains a stance adopted in 1996 linking relations to improvements in human rights in the country. 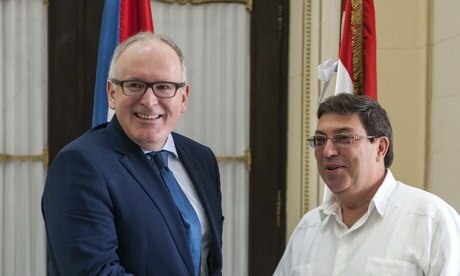 The Netherlands had a “special interest in strengthening bilateral relations” with Cuba following reforms launched three years ago by Cuban President Raul Castro, Timmermans said. The Netherlands is the second biggest European business partner of Cuba, behind Spain, with deals worth $792 million in 2012, according to Cuban figures. The EU’s top diplomat Catherine Ashton was asked in 2010 to explore a possible softening of the bloc’s stance towards Cuba following its release of dissidents and its economic reforms.